Hello everyone, from New York Comic Con! This weekend, your friendly neighborhood Book Smugglers are at the Javits Center, enjoying the panels, exhibitors, and assorted sundries. While we’re out, we are thrilled to run a giveaway of the paperback edition of Miss Peregrine’s Home for Peculiar Children by Ransom Riggs, plus Hollow City posters, courtesy of Quirk books! September 3, 1940. Ten peculiar children flee an army of deadly monsters. And only one person can help them—but she’s trapped in the body of a bird. 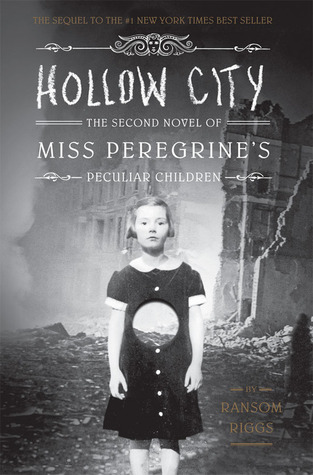 Hollow City draws readers into a richly imagined world of telepathy and time loops, of sideshows and shapeshifters—a world populated with adult “peculiars,” murderous wights, and an entire menagerie of uncanny animals. Like its predecessor, this second novel in the Peculiar Children series blends thrilling fantasy with never-before-published vintage photography to create a one-of-akind reading experience. A strange collection of vintage photography. It all waits to be discovered in Miss Peregrine’s Home for Peculiar Children, a spine-tingling YA fantasy illustrated with haunting black-and-white photography. The hardcover edition spent more than 52 consecutive weeks on the New York Times Best-Seller List. This beautifully designed paperback edition features an exclusive interview with author Ransom Riggs and a sneak preview of the upcoming Miss Peregrine novel. RANSOM RIGGS is the #1 New York Times best-selling author of Miss Peregrine’s Home for Peculiar Children. He is also the author of Talking Pictures (Harper Collins, 2012) and The Sherlock Holmes Handbook (Quirk, 2008). He is a graduate of the University of Southern California School of Cinematic Arts and lives in Los Angeles. Follow Ransom on his blog, twitter (@ransomriggs), and facebook. 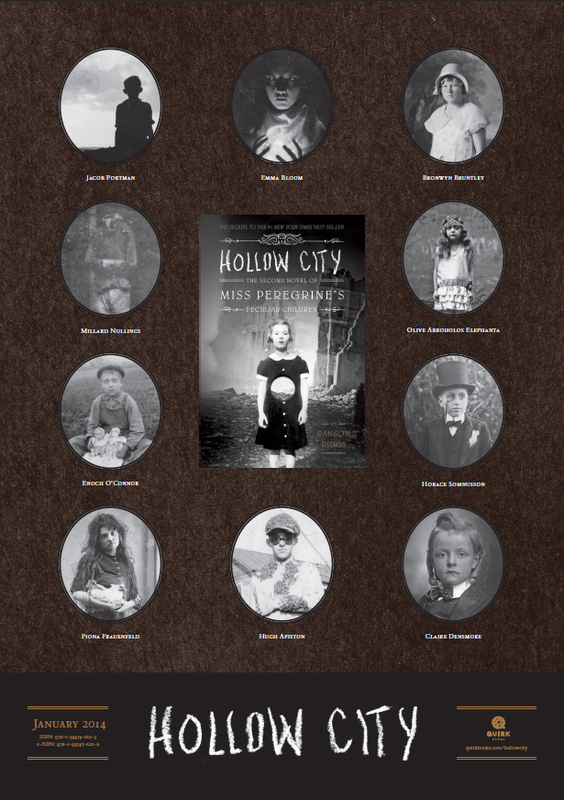 We are giving away three copies of Miss Peregrine’s Home for Peculiar Children (book 1) as well as three copies of these gorgeously creepy posters for book 2, Hollow City. The contest is open to US addresses only and will run until Sunday October 21 at 12:01am. To enter, use the form below! 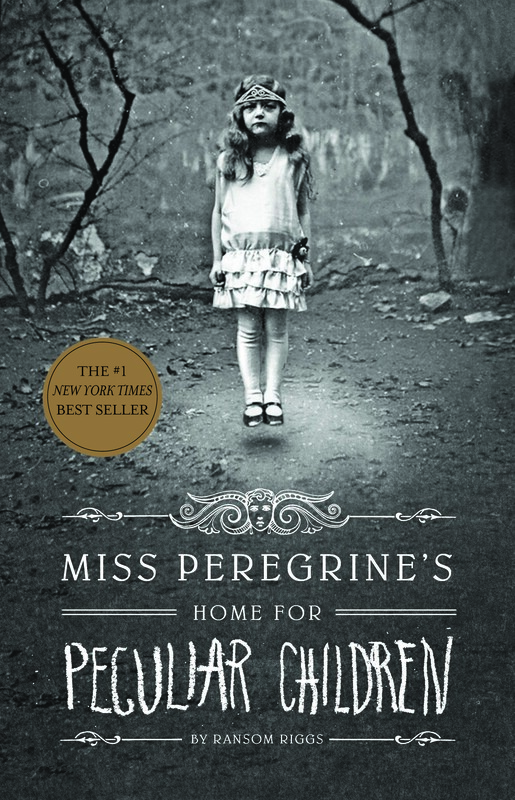 Why, Miss Peregrine’s Home for Peculiar Children, of course! Okay, this is not fair!!! what about the ones who aren’t in the US??? Hm I think Miss Peregrine is up there in terms of my favourite YA spooky read – esp. the lead up to Jacob going to England. Marvelous! I liked Miss Peregrine too. I also liked The Diviners by Bray – pretty awesome spooky read. My favorite spooky YA read is “The Monstrumologist” by Rick Yancey. I do not really read spooky but these look interesting so I might try outside my usual habits. Definitely it has to be the first book in this series. I was blown away by the amazing world building. Mary Downing Hahn’s Wait Till Helen Comes, Halloween read since I was a kid. There has been quite a few, but I would say Poison. I would love to read this book. Thanks for having the giveaway. I haven’t read much spooky YA, I’ll admit I’m a wuss. Out of what I’ve read I liked The Coldest Girl in Coldtown best. Good question, maybe The Graveyard Book by Neil Gaiman? I’m not sure which creepy books I’ve read are YA though. Hmm…I don’t read a lot of “spooky” books, but as far as dark books go, I just finished Kit Grindstaff’s a Flame in the Mist, and once upon a time I read Laurie Stolarz Blue is for Nightmare’s series, and that was also really good. I haven’t read any spooky YA, but Amanda Stevens has a very spooky adult series. The Jason Strange books are pretty creepy for young readers. There’s something about Scott Westerfeld and it’s discussion of creepy crawly things that I find so spooky. After Miss Peregrine’s School for Peculiar Children. Rick Yancey’s Monstrumologist series is awesomely creepy. I loved Holly Black’s Doll Bones. i love anna dressed in blood!!! Anything by R.L. Stine. Also I loved Patient Zero by Johnathan Maberry & The Anna Dressed In Blood Series by Kendare Blake. Does Edgar Allan Poe count as YA? Because his works will always be the spookiest to me. Miss Peregrine’s ranks pretty high– I couldn’t read it with the lights out, haha. My favourite spooky read is the ‘Blue is for Nightmares’ series by Laurie Faria Stolarz. Ooh, I’m in love with The Lynburn Legacy books (Unspoken and Untold). I also really enjoyed Between the Devil and the Deep Blue Sea. I’m not sure if I have a favorite, but a few good ones were The Book of Lost Things by John Connolly, The Replacement by Brenna Yovanoff, and Dollhouse by Anya Allyn. And, of course, Miss Peregrine. @Lan, I LOVE Wait Till Helen Comes. One of my favorite ghost stories growing up. Miss Peregrine’s is definitely one of my favorite YAs! It’s been a while since I’ve read other spooky YA stories, but I loved What the Night Knows by Dean Koontz for adults. I think the spookiest YA I’ve read is The Diviners or Coldest Girl in Coldtown. I haven’t read any yet sadly! But so many i want to get my hands on! !